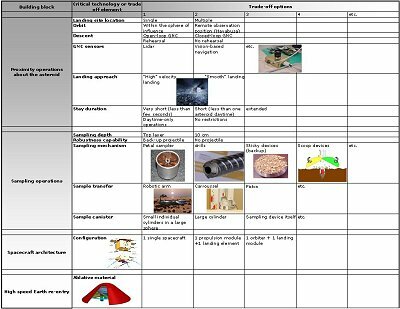 The NEA-SR Technology Reference Study (TRS) is a concept study which primarily aims at understanding the requirements and technological drivers for returning a scientifically valuable sample from a primitive Near Earth Asteroid to Earth. This completed activity builds on the study heritage provided by the Deimos Sample Return TRS. The final goal of the study is to establish a mission design which is able to fulfil this particular objective in a cost-efficient way and to provide a study reference for such a mission concept. Asteroids are a unique source of information about the history of the solar system. The study of asteroids would greatly enhance our knowledge of the initial conditions of the planetary nebula, the formation process of terrestrial planets, the link between meteorite type and asteroid classification and the organics in primitive and evolved materials. Asteroids differ among each other in their orbit type (Near Earth, Main-Belt, Trojans, etc. ), physical characteristics (mass, volume, density, shape, etc.) and composition (chemical, mineralogical). Yet, they can be classified1. In this respect, so-called carbonaceous C-type asteroids are considered to be among the most primitive types of asteroids. Why a NEA and which one? Due to an easier accessibility in terms of orbital mechanics, Near Earth Asteroids (NEAs) are the target of choice for such a mission concept. 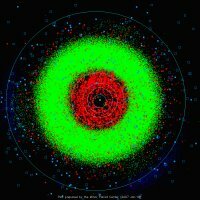 NEAs represent a population similar to the main belt asteroids reflecting the remnant bodies which accreted to form planets. More than 4200 NEA have been discovered to date in the Earth's neighbourhood. A mission analysis was performed to identify the most easily reachable ones. The asteroid 1999 JU3 was chosen for the study as the most accessible known C-type asteroid (status as of May 2007). Unfortunately, the spectral type of most NEAs is unknown due to limited opportunities for ground observations. As a consequence there are ~ 10 "unknown-type" asteroids that are easier to reach than JU3. 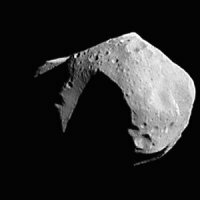 On its way to Eros, NEAR imaged the C-type asteroid Mathilde. T-his type of asteroid is favoured in a sample return scenario. There are more than 365 000 asteroids in the solar system. In green, the main-belt asteroids. In red, the NEAs. The Stardust sample return capsule returned safely to Earth. In contrast to Stardust, a hard landing (without parachute) is baselined for NEA-SR. It is widely acknowledged that a sample from any space body has a much greater scientific value if it is returned to, and analysed on, Earth. The increased scientific return lies in the capability to perform far more extensive and advanced ground-based laboratory analysis. Almost 4 decades after the Apollo missions to the Moon, scientists are still learning from the lunar samples that were returned to Earth at that time. Beyond the tremendous scientific benefit, other reasons make a sample return more attractive for such a mission. Throughout its planetary mission programme, ESA has acquired a well-recognized expertise for in-situ planetary applications (Giotto, Mars Express, Rosetta including the lander Philae, Cassini-Huygens, Venus Express) upon which future missions will build (such as BepiColombo, ExoMars). Sample return missions represent the next step in the in-situ exploration of solar system major and minor planetary bodies with respect to scientific investigations but also in terms of technology development. For example, the low gravity environment of an asteroid is ideally suited to test some of the enabling technologies for later (more demanding high gravity) sample return missions such as a Mars Sample Return mission. In the early stage of the precursor NEA-SR TRS study, this "ground-breaking" concept of a sample return mission was traded against a more conventional in-situ analysis mission. A true sample return was selected and the design of a reference mission concept was derived. In parallel, the global spacecraft preliminary design is being carried out for all other sub-systems such as thermal, power, structure, data handling, telecommunications, etc. The selection of the landing site is a crucial phase during remote sensing operations to mitigate the presence of hazards (rocks, boulders, steep slopes, etc.). The design of these elements has to cope with a harsh environment around the asteroid: large temperature variations, irregular body shape, dusty surface, very low-gravity, unknown soil properties, etc. The study will help define the requirements and constraints placed on the spacecraft technologies so that technology development programs can be implemented in a timely manner. Based upon the above considerations, a baseline concept was selected and a preliminary design was identified. The primary goal that a baseline design has to fulfil is to help understand the main challenges related to such a cost-efficient scenario. The selected mission concept is based on an all-chemical propulsion transfer to and from the asteroid 1999 JU3. The main spacecraft acts as an Orbiter, Lander and Earth Return Vehicle (OLERV) which is delivered to the asteroid by a Propulsion Module based on the LISA Pathfinder propulsion module, jettisoned at arrival. 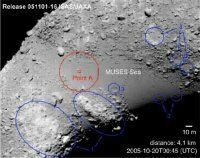 After a 2½ year interplanetary transfer, a remote sensing phase to characterize the asteroid’s physical and composition properties and to select a safe landing site is conducted. This phase (including rehearsals and sampling operations) can vary from 3 up to 10 months. The sampling operations consist of an autonomous short-stay landing and sampling procedure. Eventually, the whole spacecraft returns to Earth. At Earth arrival, the ERC is ejected and subsequently performs a high speed Earth Re-entry (12.5 kms-1) and hard landing with a crushable structure on ground where the sample is retrieved. Alternatively, the spacecraft could stay longer on the surface in order to perform extensive in-situ science and to involve ground-based feedback in the sampling decision process (communication times are too short in the baseline scenario to allow ground-based decisions). This option was investigated. It was shown that this results in power requirements that are too large and a more complex landing legs design. This compromises the cost-efficiency and risk-minimization objectives of this concept. This option is therefore discarded for this study. A minimum payload package to safely return a sample back to Earth is implemented, consisting of the following: radio science experiment, narrow/wide angle cameras, UV-visible-infrared spectrometer, radar altimeter (as a GNC sensor). In the current baseline, no in-situ instruments are included. However, it is interesting to note that the launch mass margin of the baseline design allows carrying up to 270 kg (if jettisoned at the asteroid; 200 kg if returned) extra mass to the asteroid. The available pure payload mass is necessarily less than that due to structure strengthening, harness, increased power/thermal requirements, etc. Nevertheless, additional remote sensing instruments could be included such as: laser altimeter, thermal radiometer, reflective radar tomographer, X-ray spectrometer, Gamma-ray/Neutron spectrometer, etc. In addition, the available extra mass could be used for in-situ instruments (however with limitation on the surface stay time) and/or a separate dedicated in-situ science lander (Philae-type) with in-situ instruments such as: mole, alpha-p-X-ray spectrometer, Mossbauer spectrometer, laser mass spectrometer, sub-surface imager, etc. It is to be noted that the selection of all instruments was made for the purpose of the study only. Many variations can be thought of depending on the in-situ science objectives that one wants to achieve. As a baseline a Soyuz 2-1 B rocket launched from Kourou (French Guiana) in December 2016 is used. The minimum total stay around the asteroid is of the order of ~10 months. The ERC comes back to Earth in December 2020. The required ΔV to reach 1999 JU3 for the baseline scenario is ~ 2550 ms-1 from geostationary transfer orbit (GTO). In order to be compatible with an alternative launch date, all ΔV figures are sized for the 2016 launch opportunity and another one to 1999 JU3 in 2020, therefore the return ΔV (51 ms-1 for 2016 opportunity) of 644 ms-1 (2020 opportunity) was used. The following table summarizes the different phases of the mission concept. The baseline NEA-SR OLERV, comprising the Asteroid Lander and Earth Return Vehicle, with the Earth Re-entry Capsule on top. The spacecraft is placed onto an intermediary 500 m altitude orbit in order to get the most accurate position and velocity estimation in coordination with the ground prior to final descent. As of last burn, the 40 minute descent sequence is fully autonomous until the spacecraft returns to an intermediary orbit. The descent and landing accuracy and safety is ensured by a vision-based navigation system. A conceptual trajectory is shown below. The horizontal position accuracy should be better than 4-5 m while the landing velocity is limited to 25 cms-1 and 5 cms-1 for the vertical and horizontal components respectively. The sampling mechanism, consisting of a roto-translating corer mounted at the tip of a robotic arm. Upon landing, the kinetic energy is absorbed by specifically designed landing legs and the reaction forces are compensated for by a down-thrust at contact. The down-thrust is maintained during the 20 minute sampling operations in order to cancel out any force or torque required by the sampling mechanism. After sampling operations are completed, the re-ascent is immediate. No extended stay is foreseen (see above). The sampling mechanism consists of a roto-translating corer mounted at the tip of a robotic arm. It can collect up to 100 g at once and is capable of maintaining the stratigraphy of the sample. The coring tool is placed into a cylindrical sample container which is transferred to the Earth Re-entry Capsule (ERC) before departure. 3 interchangeable coring tools are included so that up to 3 sampling sequences can be performed and 300 g of material can be collected. One of the primary goals of the NEA-SR TRS was to identify enabling technologies for potential future small body sample return mission concepts. The key critical technologies are listed below with the Technology Readiness Level (TRL) indicated. This study was completed in May 2007 and was conducted by SRE-PAP and an industrial team led by Astrium Ltd (Prime). Further support was provided by Astrium GmbH (knowledge transfer from Don Quijote), Astrium SAS (GNC), Galileo Avionica (Sampling operations and mechanism) and Astrium SAS-ST (Earth re-entry operations and capsule design).